With the implementation of GST, prices have gone up and affected many people. Thus, my colleagues asked me.. How can I afford to buy so much? Since I receive parcels every week at the office. One even asked if I spent my entire paycheck on shopping xD Well, the truth is.. I haven't stopped shopping but I'm now shopping smartly with ShopBack Malaysia! I mean honestly, how many times have you gotten 'rebates' that are actually shopping credits? 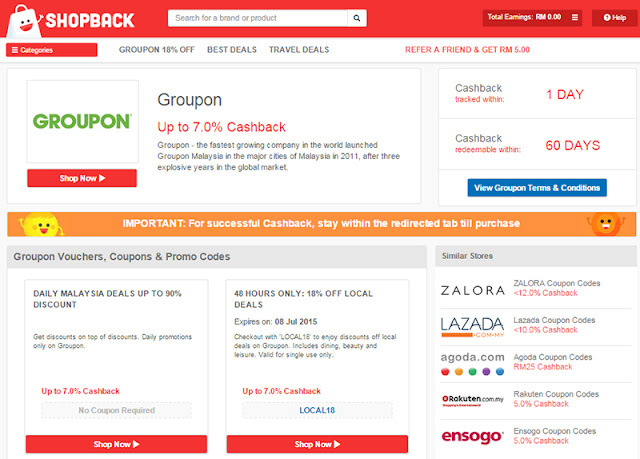 At ShopBack, you can cash out and convert the rebates into Ringgit, to shop more! With a little here and a little there, you tend to forget about that RM 5. I love how ShopBack gathers all the brands so that your rebates can all go under one account. A few RM 5s will become a mountain! My first ShopBack purchase was on Groupon because I saw this awesome 18% off promo. For a meal that was originally RM164.05, I paid RM 45.10 AND got RM 3.16 rebate into my ShopBack account so technically I got 74% off woohoo! Wheee can see my earnings in my account on the same day. Just regret not knowing about ShopBack earlier. Imagine all the money I could have saved! Argh~~ But it's okay.. 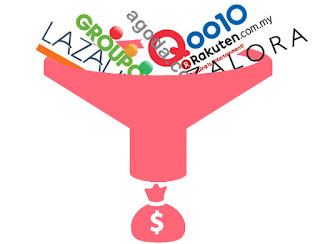 I will start to save now..
You can find the best beauty deals and coupons such as Luxola, Sasa & Hermo on ShopBack Malaysia. this is like my fav site to go to when i do online shopping, i had gotten quite some cashback since, love it. I like to check out online shopping, thanks for sharing this new web. Really nice to offer cashback and savings.. :) Time to shop! Yeah! Especially if you shop online a lot..
Great idea hmmm...time to visit shopback ! I do shop online as I get cash back or rebate . Recently I bought a lot from Zalora or 11 street. They give a lot rebate and we can get a good deal rather than buy at shop. First time coming across this so thanks for sharing! Nooooooo! Bad time to be reading this post. I'm trying to save up to travel, so I've never shopped in months. You just brought every strain of desire to shop to my itchy fingers. Arggghhh. I hate you so much right now, I'm just gonna leave this nasty comment right here. P/S: I'm just kidding. Please don't hate me. Cool! Didn't know about such website, awesome! Thx for sharing! I am using Shopback also. The cashback process only takes 2 hours.